Tasty and meaty boneless country-style ribs make a quick and easy skillet meal for any night of the week. 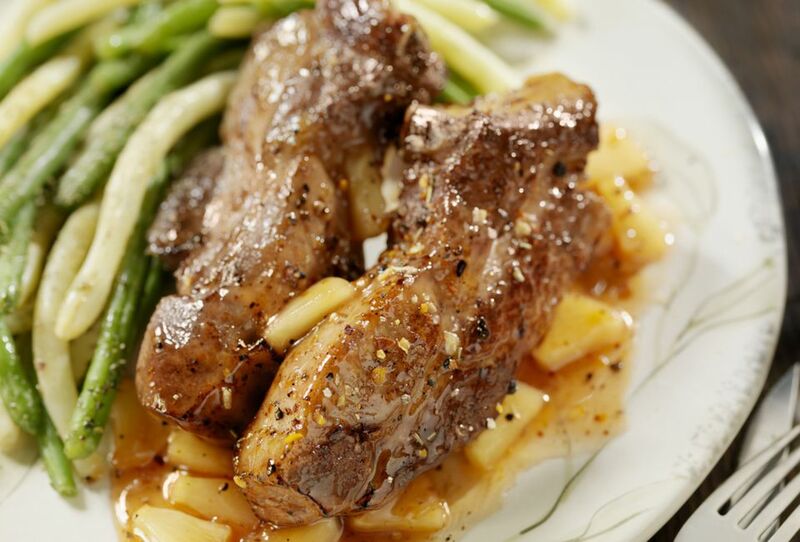 Serve these flavorful country-style ribs with roasted or mashed potatoes and your favorite vegetables. In a large skillet or sauté pan, heat 2 tablespoons olive oil over medium heat. Add the onions and sauté, stirring frequently, until softened. Turn down to low and continue cooking, stirring occasionally, until the onions are browned, about 8 to 10 minutes. Remove onions to a plate and set aside. Add 1 to 2 tablespoons of extra virgin olive oil to the skillet and set over medium-high heat. Sprinkle pork with salt and pepper; dredge in the flour. Add the pork to the pan and cook, turning frequently, until browned on all sides, about 10 minutes. Add chicken broth to the skillet, cover, and continue cooking over medium-low heat for 20 minutes. Meanwhile, combine the preserves, brown sugar, water, curry powder, and garlic in a bowl; stir in the onions. Add the onion mixture to the skillet and continue cooking, uncovered, for 5 minutes.